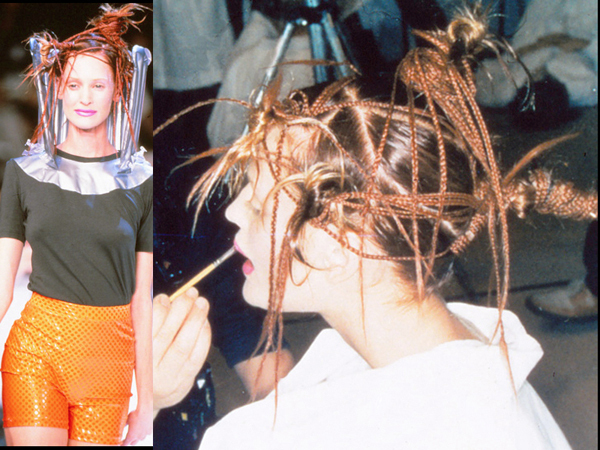 Home » Posts Tagged "Tiny Braids"
Tiny braids as never seen before, John Sahag’s abstract hair, photographed at the Issey Miyake Spring/Summer 1996 Fashion Week show in Paris. The hair included unusual knots, add-ons, take-off wired, bendable hairpieces (“like vines”) often with sections floating in the air. For more on this show, and Sahag’s wonderful words, read under each photo, scroll back and forth, click here.